888poker Club Road to Rewards! 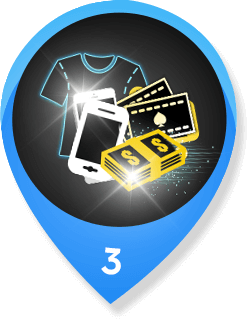 888poker club - Your Road to rewards! Hit the tables, play casino games or bet on sports and you’ll automatically collect points & complete challenges as you go. Once you reach the target amount of points for each level, you’ll receive a bunch of shiny Gold Tokens & move up to the next level. Kerching! Redeem your Gold Tokens for prizes! Bag yourself some awesome prizes with your Gold Tokens. Just visit our Redeem Page & pick your prize! Daily Freerolls We’ve got Freerolls running every day from Level 5+, so you can win MORE! Prize Scratchcards Each time you climb 5 levels, you’ll win a Club Scratchcard. Bonus Levels Get your hands on loads of cool goodies and bonuses when you reach ‘Bonus Levels’. Once you visit our 888poker Club, you’ll get to choose from our fun selection of Club Challenges and start playing to earn points. Play the poker games you know and love, place bets on sports, enjoy casino games – you’ll even get points in our ‘Friends with Benefits’ Challenge if your friends sign up. Whatever way you like to play, we’ve got something you’ll enjoy. Each Challenge will offer a different amount of points and will take different amounts of time to complete. Although you’ll need to complete some of the Challenges in order to earn points, with others, you’ll accumulate points automatically along the way. Once you finish a Challenge, you can move on to any of the others next. So keep playing, and keep winning! Level up! Once you’ve collected enough points - bravo! -you’ll make it to the next level. You’ll need a different number of points to complete each level and you won’t ever be sent to the level below, so the only way is up! Plus, to spice things up, we’ll introduce new Club Challenges as you move up levels. So make sure you check out what’s on offer! Go for gold! 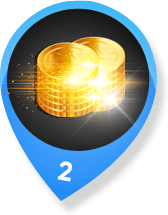 Each time you make it to the next level, you’ll receive a bunch of shiny gold tokens, a different amount of Gold Tokens for each level you reach. Then you can start earning points again to reach the next level and win some more! To spice things up, we’ll introduce new Club Challenges as you move up levels. So make sure you check out what’s on offer! Redeem your Gold Tokens for cool prizes! Now that you’ve bagged yourself some Gold Tokens, it’s time to pick your prize! Just visit our Redeem Page and choose from our selection. Different prizes will require a different amount of Gold Tokens, so no matter what level you’re on, we should have something in your reach. Playing never paid so good, ey?